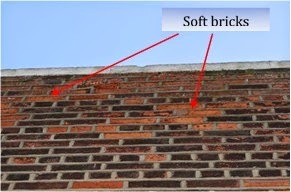 Some of the brickwork is poorly pointed and soft bricks need to be replaced. The parapets and asphalt flooring of many balconies are in poor condition. 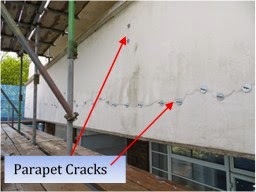 Cracks need to be repaired and floors re-asphalted. It should be noted that much of the damage to balcony flooring has been caused by barbeques and residents placing inappropriate items on the asphalt surfaces. Asphalt is relatively soft and melts when heated. 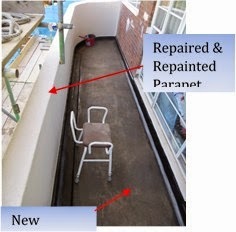 Damaged asphalt allows water ingress, which damages the fabric of the building, so it is important that residents look after their balconies. Paint protects the building and improves its appearance. Lichfield Court is now due for repainting. 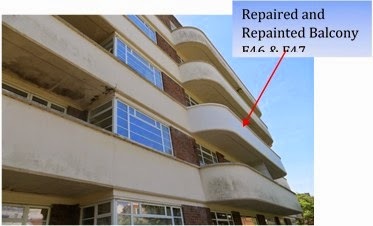 Our professional team has identified a new paint product that fills small cracks as well as covering the surfaces, and was used successfully on the trial balconies shown above. This obviates the need to rake out and fill small cracks, which should save time and money. The work is expected to complete in Spring 2015 at an estimated cost of £2.1m. This will be recovered from Leaseholders at a rate of £600k in 2014, 2015 and 2016 and £300k in 2017. The terms of the loan of £1m meant that is was not possible to spread the cost evenly across the four years.